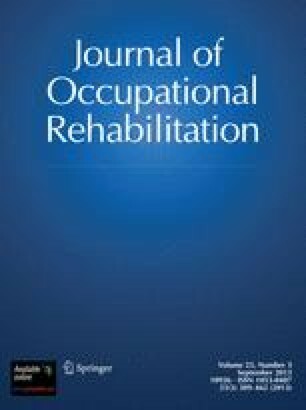 Introduction: Behaviorally oriented graded activity interventions have been suggested for sick-listed workers with low back pain on return to work, but have not been extensively evaluated. Methods: One hundred and thirty-four workers were randomly assigned to either a graded activity intervention (n = 67) or usual care (n = 67) and followed-up for 12 months. Results: The graded activity group returned back to work faster with a median of 54 days compared to 67 days in the usual care group. The graded activity intervention was more effective after approximately 50 days post-randomization (HRR = 1.9, CI = 1.2–3.1, p = 0.01). Differences between the groups in number of recurrent episodes, total number of days of sick leave due to low back pain, and total number of days of sick leave due to all diagnoses, were in favor of the graded activity group, although not statistically significant. No effects of the graded activity intervention were found for functional status or pain. Conclusion: Graded activity intervention is a valuable strategy to enhance short-term return to work outcomes.